While visiting the Holocaust Museum in Jerusalem, I was struck by a book entitled, To Bear Witness. Every day we hear about Israel’s side of the story, one where Palestinians throw rocks and set off bombs. But today we bear witness to the other side of the story, a story of military occupation, a story that some even call apartheid. Walking around Bethlehem, one of the first things we noticed was the massive concrete wall, complete with watch towers and Israeli guards. 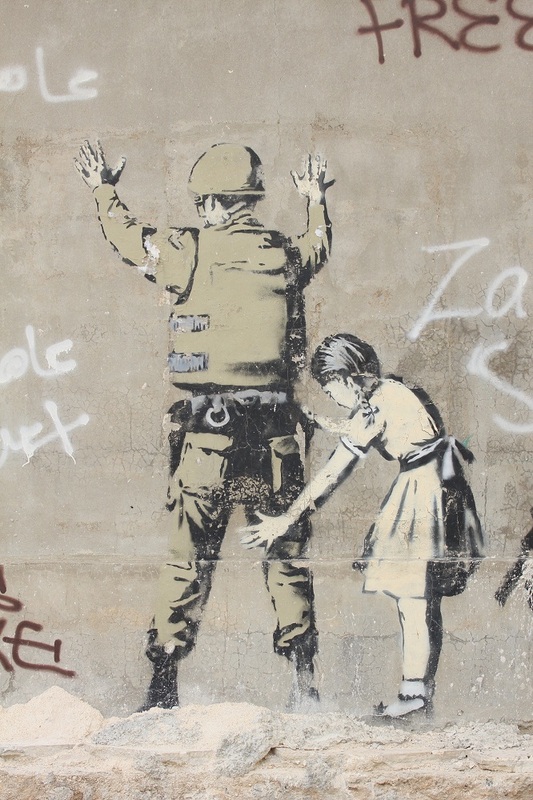 At eight meters, the wall along Bethlehem is TWICE as tall as the Berlin Wall. It’s projected to be four times as long. 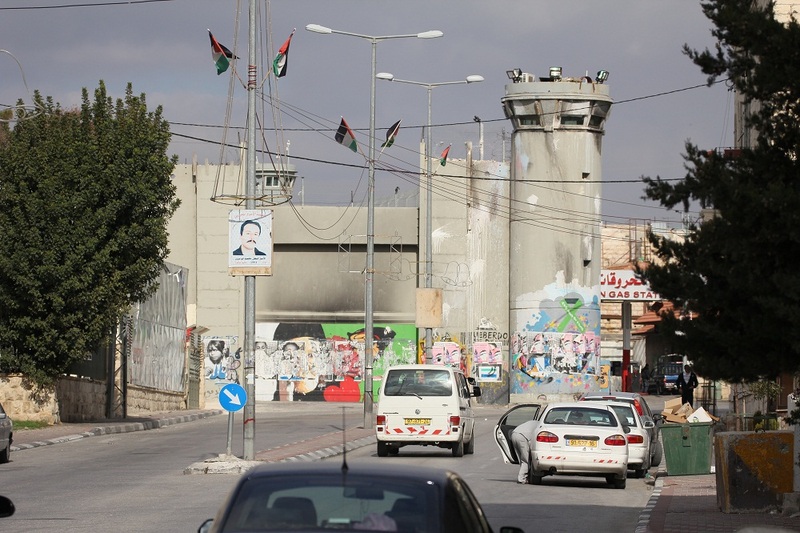 Like the Berlin Wall, one side (Israeli) is grey and bleak while the other (Palestinian) is full of murals and objections. Language reflects what side of the argument people are on. Palestinians and pro-Palestinians refer to the wall as the “Apartheid Wall” or “Berlin Wall”. Those on Israel’s side call it a “Separation Fence”. 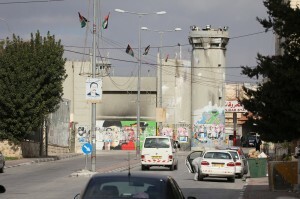 Israel’s controversial “Security Wall” is slowly imprisoning West Bank cities like Bethlehem. Israel claims the wall is a temporary structure to physically separate the West Bank from Israel and that it counteracts suicide attacks on the Israeli people. However, 90% percent of the wall has been built on Palestinian land, not on the Green Line, the internationally recognized border that existed between Israel and the West Bank. The wall cuts off Palestinian communities and families from one another, separates farmers from their land, and isolates people from their workplaces, schools, and health care facilities. In route to the hospital, an alarming number of pregnant mothers give birth at the wall’s checkpoints because the security process takes too long, they are denied thoroughfare, or the 24-hour checkpoint is not open. Amnesty International maintains that the construction of the wall within Palistinian territory breaks international law and violates human rights. One morning we walked through the checkpoint (to exit Bethlehem and enter Israel to catch the bus to Jerusalem). We walked single file up what I can only describe as a very long cattle chute and passed through a turnstile (mechanical gate with horizontal bars so only one person may pass through at a time) before going through the security ex-ray and having our passports checked for a second time. This process can be lengthy and we heard the line is particularly long in the early morning, when people can spend several hours waiting to pass through security on their way to work. One day we visited the West Bank city of Hebron and accompanied a Christian Peacemaker Team (CPT) on their rounds. This team, which consisted of a middle-aged woman and two women over the age of 70 (all from the US), serves as a neutral party as it observes checkpoints in Hebron to keep tabs on Israeli soldiers so they don’t detain a Palestinian for “too long”. The young Israeli soldiers (18-20 years) only check passports and paperwork at these checkpoints, but they will hold Palestinians for longer than necessary and sometimes intimidate, humiliate, and harass them… simply because they can. “Too long” has been defined as twenty minutes, at which point the CPT calls another organization which arrives at the checkpoint and steps in to mediate any conflict that is taking place. Did the world not celebrate when the Berlin Wall fell?! So why is it now turning a blind eye to the one in Palestine? Written by: kate on January 21, 2012.on January 30, 2012.